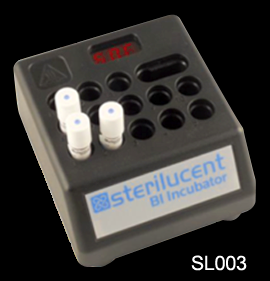 The Sterilucent incubators are for use with Sterilucent™ Biological Indicators (BI). The SL003 Incubator features a built-in thermometer with LCD display, 13 incubation cavities and an integrated activation (crushing) cavity. The SL004 Biological Indicator Monitoring System features a touch-sensitive, color liquids crystal display (LCD) for interacting with the powerful, feature-rich user interface. 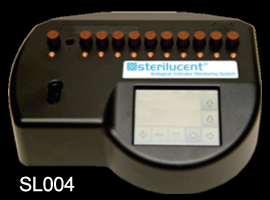 With minimal training, the operator can easily monitor the incubation status and review test history. The intuitive interface guides the user through data entry screens each time a BI is inserted for incubation – helping to ensure test report data is accurate and complete. The incubator monitors the SL002 biological indicator during incubation and alerts the user when growth is detected (positive) or when the incubator period ended without any growth detected (negative). All test results are automatically printed to the attached printer. The SL004 has ten wells for exposed BIs and one well for the unexposed positive control.